Featuring George Takei, Brad Takei, Nancy Takei, William Shatner, Leonard Nimoy, Nichelle Nichols, Walter Koenig, Howard Stern, Dan Savage, Daniel Inouye, B.D. Wong, Wil Wheaton, Dan Parent, John Cho, Tom Ammiano, Norman Mineta and Lea Salonga. Written by Jennifer M. Kroot. Directed by Jennifer M. Kroot. Distributed by Starz Media. 93 minutes. Not Rated. George Takei may be best known for playing Lt. Sulu on Star Trek, a TV series that went off the air 45 years ago, but he has had something of a fascinating resurrection in recent years. And even before his recent semi-return to prominence (he could not exactly be called a star at this point in his career, but he has become a beloved elder statesman), Takei had a life which was full of drama. Sadly in making her film about Takei, director Jennifer Kroots can’t quite decide if the movie should be a straight documentary or reality television, and things bounce back and forth from serious to fluff. 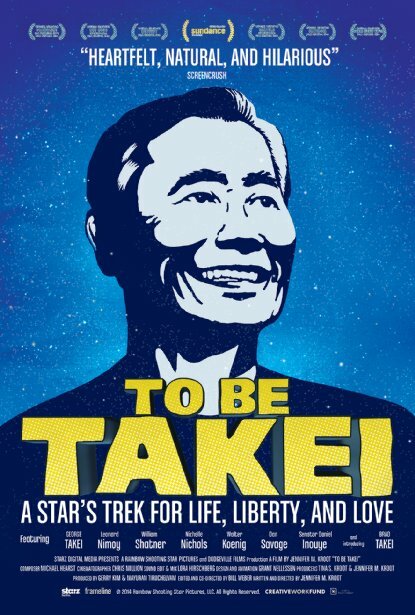 There are some truly fascinating aspects to Takei’s life. As a child, his family was sent to Japanese internment camps during World War II. He took on Hollywood in the fifties and sixties, becoming a minor star despite having two serious setbacks. He was a Japanese-American actor at a time in which Asian roles were sparse and generally badly stereotypical. To make things even more complex, he was also a closeted homosexual. It is nice to see that all these years later, long after Takei’s career slowed to a trickle, he has been able to use his past fame and genuine personality to recreate himself as a spokesman for the LGBT community as well as a beloved pithy Facebook presence (over five million friends and counting) and a regular guest announcer on The Howard Stern Show. However, while Koons shares all of these things with us with the seriousness and intensity they deserve, she can’t help but toss in lots of much less interesting “real life” footage of George getting a haircut, George hanging out at science fiction conventions, George sitting in diners, George camping with his husband and the making of a musical called Allegiance loosely based upon Takei’s experience as a child in the internment camps. However, the film is fascinating when looking at the important passages of Takei’s life. The actor discusses the time spent in the internment camps with passion and anger – but very little bitterness. His stories of how his family and himself were forever changed by the experience are touching and personal. Finally, he also discusses his life as a gay man, including his long-time relationship. Takei’s husband Brad seems rather ill-at-ease on camera, though he sticks it out throughout like a trouper, doing whatever is asked of him by Takei and the filmmakers. Despite the fact that Takei is now pretty much thought of as everyone’s cool gay Asian uncle, even Takei shows that he has some flaws. Husband Brad points out that he can be a bit passive aggressive, noting others’ problems and then masking the intent by laughing. Takei fat-shames Brad on camera (as well as Star Trek: The Next Generation actor Wil Wheaton), claiming it is done out of good-natured concern, but both men are obviously stung by the statement. However, you do get the feeling that George Takei is a genuinely happy man who holds very little ill will to most people who are not named Shatner. And while you do not really get a penetratingly deep look at his life here, the guy is good enough company that an hour and a half flies by. Tags: B.D. Wong, Brad Takei, Dan Parent, Dan Savage, Daniel Inouye, George Takei, Howard Stern, jay s jacobs, Jennifer M. Kroot, john cho, Lea Salonga, Leonard Nimoy, movie review, Nancy Takei, Nichelle Nichols, Norman Mineta, PopEntertainment.com, To Be Takei, Tom Ammiano, Walter Koenig, Wil Wheaton, William Shatner. Bookmark the permalink.